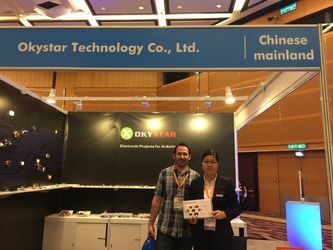 Oky Newstar Technology is registered in Hong Kong, a joint venture by OKYSTAR TECHNOLOGY GROUP CO. LIMITED. 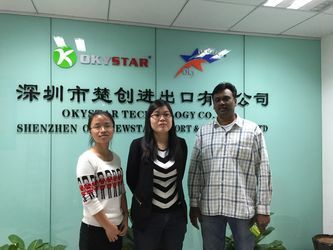 Oky Newstar Technology locate itself in Longhua, Shenzhen, China, the capital of consumer electronics. 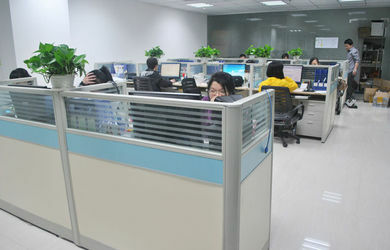 We acquire the OEM order from Hisence, and since keep close business cooperation. 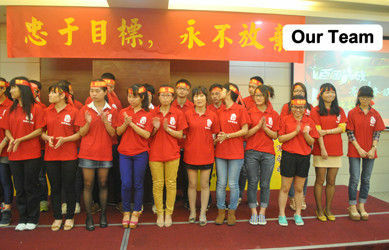 For preparation for Christmas order and Chinese New Year order, we double our staff to 100 employees. Oky Newstar Technology is recognized as the Supplier of the Year by Hisence. Two new assembly lines are set up. Together come with two German engineers. Oky Newstar and Sicube sign a memorandum, to establish a stratigical cooperation. Vice Mayor of Baoan District, Shenzhen City, visits our factory. 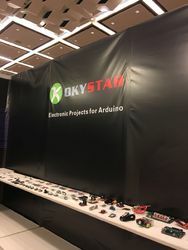 Oky Newstar introduces its first own brand Board for Arduino, and we prepared a Project Board Student Learning Kit, which is recommended for use across multiple courses ranging from introductory circuit design to embedded programming to senior design projects. Best suited for lab-based courses requiring students to prototype a stand-alone electronic circuit or interface control logic to a processor. 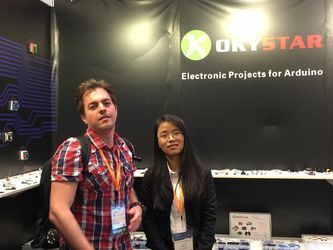 Oky Newstar introduces several microcontroller boards for Arduino, The microcontroller on the board is programmed using the Arduino programming language(based on Wiring) and the Arduino development environment (based on Processing). Arduino projects can be stand-alone or they can communicate with software running on a computer (e.g. Flash, MaxMSP, Processing). A robot shield for Arduino is introduced, this shield makes it easy to build an Arduino-controlled robot. The shield mounts onto an assembled chassis, connecting directly to the chassis’s battery terminals and motors, and the Arduino plugs into the shield, face down. The shield includes dual motor drivers, a buzzer for playing simple sounds and music, a user pushbutton, and a 3-axis accelerometer and compass. It boosts the battery voltage to power the Arduino, and it breaks out the Arduino I/O lines, reset button, and user LED for convenient access and to accommodate additional sensors for things like obstacle and edge detection. This year, we start the ODM business with oversea clients. 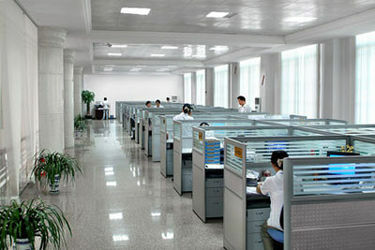 With the rapid growth of business, our staff reach the number of 900. Oky Newstar is certificated as a ISO 9001:2008 compliance factory. 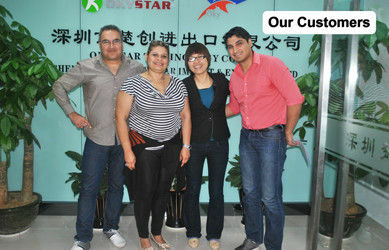 We opened a subsidiary in Venezuela. Our 3d printer module for Arduino comes out of lab. By then, we have established robust relationship with selected distributors in South America , East Europe and Middle East. 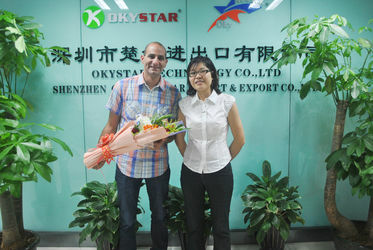 As a result of overcrowded office and plant, we move to the new factory in Longhua, Shenzhen. 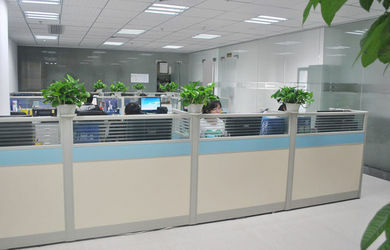 We invest RMB 6 million in testing lab, to ensure the best quality. 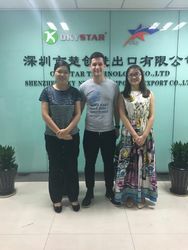 We help one of our European OEM clients receive CE certificate from third party lab. 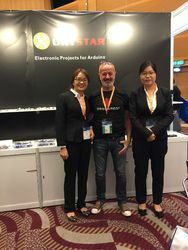 We introduce MCU board product line to old customers in HK electronics fair. 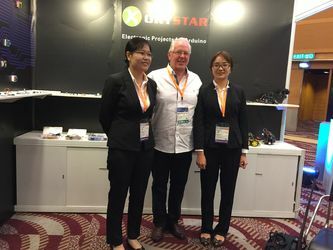 Oky Newstar Technology acquires Sunshine Industrial Design to help meet OEM client requirement. Our smart Car Accessories released, aiming students who are interested with Arduino. We file several patent applications to SIPO for our finance tablet pc. We focus on OEM market, especially the oversea markets. We became a member of the "shenzhen chamber of E-Commerce" . Awarded as Most Reliable Partner from Cube. We introduce some new kits for Arduino, till then, we have developed an integrated product line for most modules, shield and sensor for Arduino. 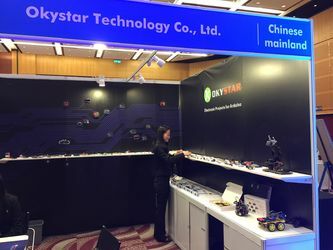 Till Oct 1st 2013, Okystar Group have more than 1500 skilled workers and 50 technicians. Oky Newstar team expect excellence, and nothing less. We believe people are the most valuable asset. Everyone works to make the team proud. We are motivated by relentless personal and professional development, and we believe in helping each other achieve these goals to accomplish more together than what we could do alone. We hire the very best who are constantly striving to be better. We expect everyone to be visionary, thinking one step ahead of the industry and trends. Oky Newstar team act as one, moving in alignment towards our mission. We share one mission. We believe that this mission will change the world, and we work together to achieve it. We are always learning, teaching, and helping one another achieve our shared mission. We stand on each other's shoulders and bolster each other up to achieve more. We are a team. Oky Newstar team believe in service. We hire people who are passionate about our mission and our work and have a demonstrated history of service. We believe that serving others not only promotes social progress, but personal career growth, health, and happiness. 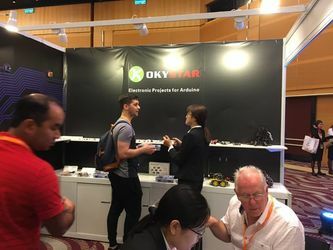 Oky Newstar team are trustworthy. Trust is built on a strong foundation of honesty, integrity, and accountability. We believe trust is the most important factor in building a strong and passionate team. We believe in open, honest, direct and respectful communication to support this. We believe in taking responsibility for mistakes--if you compromise a value, own up to it. Oky Newstar team work smart and hard. Oky Newstar team are frugal. We believe that being frugal requires being resourceful which means getting the job done in the smartest way possible. We get things done without wasting time or money. We believe that if we can make things happen with very little, we can make a heck of a lot happen with a little bit more. Oky Newstar team believe that everyone can be a leader and that everyone should lead by example. We believe that the only real training for leadership is leadership, leadership is earned not given. We believe in leadership through actions that inspire others to dream more, learn more, do more and become more.